Isn't that one showed with golden letters on red. Couldn't it be that the flag Giuseppe reported is in fact "landsefarben" of the SPQR flag? Though, that is not a custom in Apennine peninsula, but who knows. It seems that none answered my theory above . However, the photo on page 233 of [zna99] show the flag at town hall (I guess the same place where Giuseppe saw the vertical bicolour). This flag is the same dark shaded bicolour but with the coat of arms in the middle - an oval shaped shield of bright red with diagonally set inscription in yellow +SPQR al in yellow ornamented and crowned "cartouche". The colours of the Coat of Arms and those of the two flag fields are notably different. According to <www.flagsonline.it>, Rome flag is white and charged with the coat of arms and inscription. Rome flag is with the yellow is on the right side and the red on the left. I was in the city of Rome. 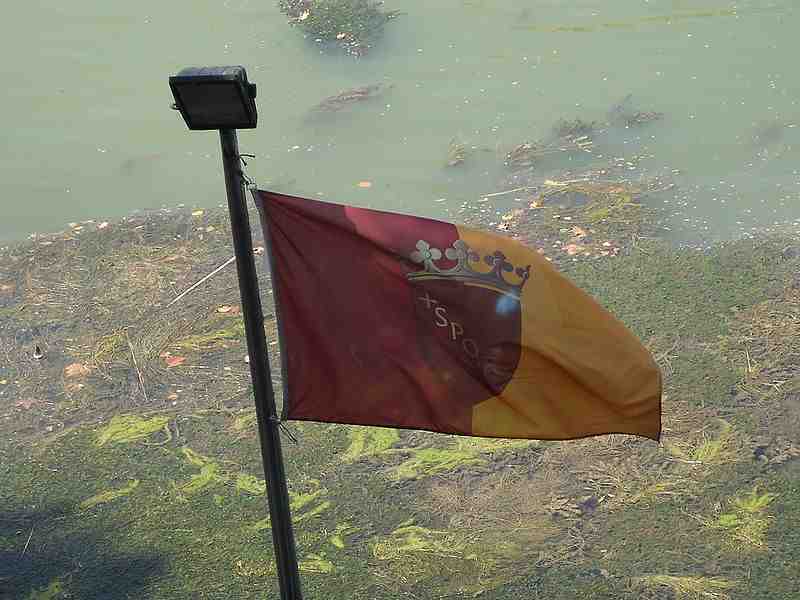 At the Tiber river, I made this picture of the city flag of Rome with the coat of arms . The coat of arms is a little bit different from the one, we have here.